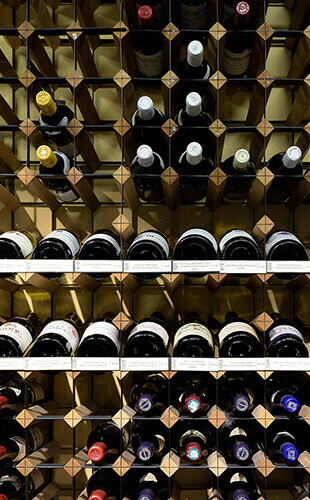 Our latest fine wine list Store your valuable bottles at home Take the professional storage option Build your own fine wine collection What is en primeur? Few homes today are able to boast a wine cellar, so here are some pointers to help you keep your wines in tip-top condition until the moment you want to draw the cork. If there’s one thing that simply must be right it’s temperature. 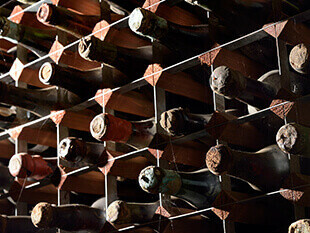 Excessive heat can quickly spoil good wine and it needs to be kept in a cool environment to avoid damage. The ideal is considered to be between 10C and 20C. The temperature doesn’t need to be constant, and allowing a gradual change between summer and winter will keep energy costs - and carbon footprints - to a minimum. The best chateaux in Bordeaux have historically permitted seasonal variation in their cellar temperatures, so you can rest assured that you are in good company. After temperature comes sunlight and vibration – both to be avoided if at all possible. Direct sunlight is likely to cause heat spikes, and some wines, notably champagne, undergo chemical changes when exposed to light for any period of time. Having identified a cool corner of the house or outbuilding for your collection, probably against a north rather than a south-facing wall, it makes sense to keep a check on the temperature during the year. Sophisticated monitoring devices are available, including web-enabled systems which will alert you to ‘rogue’ temperature readings wherever you are in the world, however in our relatively stable environment a greenhouse thermometer is usually sufficient. The challenge is to protect your valuable wines from bursts of heat, such as the summer heatwaves we occasionally experience. Some degree of insulation helps here – it takes several hours for wine inside a bottle to heat up in response to a temperature surge, and longer still if inside a wooden case – but you must take care to avoid trapping the heat in. Air conditioning is the most secure protection, but fan-assisted ventilation can be a close second in removing heat from an over-warm cellar. A purpose built wine cellar is an asset to any property, not just for its looks and ambience but also because an architect can design in the necessary temperature protection. Specialist companies can fit out the cellar with racking in attractive woods too, altogether a fine solution. Another option is a Spiral Cellar, effectively an insulated hole in the ground with an integrated staircase build into the walls. Spiral Cellars are fitted with a discreet trap door and can be installed in the floor of a kitchen, den or outbuilding. Mr.Wheeler’s team will be happy to offer suggestions and informal advice on wine storage, and to provide supplier details for all aspects of cellar creation. If you require further information or have any questions, please email [email protected]. We are always keen to hear from customers with well-stored wines which are surplus to requirements. We are interested in Bordeaux, Burgundy, Chablis, Rhône, Alsace etc, together with Italy (Tuscany and Piedmont), Australia and mature vintage port. We will normally consider unopened, original cases, preferably but not essentially stored in bond since their original purchase, and with bottles in 'as new' condition. We are seeking both the good and the great, so please do get in contact. We store all of our wine (and your reserves), in Vinothèque, the finest bonded warehouse in the UK. It is highly secure, air-conditioned, and is the perfect place for storing wine. Your wine will undergo a twice yearly condition check: once by London City Bond (who operate the warehouse) and once by our operations director and wine buyer. For your peace of mind, the wine is covered by our insurance and that of the bond at full replacement cost. Buying fine wine ‘under bond’ is the best way of guaranteeing the best provenance to any prospective buyer, should you choose to sell. You will also maximize your potential return by selling wine under bond, thereby passing on the tax liability to the person who eventually withdraws the wine for drinking. ** Providing the wine has been purchased from us. *VAT and duty correct as of March 2017. You don’t have to be an expert to know what you like, but when it comes to buying fine wine it definitely helps to have the advice of an experienced professional – which is where My Cellar comes in. Let Mr.Wheeler’s fine wine experts help you to choose an enviable selection of delicious vintages, either to lay down for personal enjoyment in years to come, or to be re-sold once they reach maturity. My Cellar is the easy and affordable way to start your fine wine collection. Simply choose your monthly subscription amount, decide whether you wish to buy for investment or drinking (or both), and advise us of your preferences in terms of style, region, and per-bottle price bracket. As your account accrues funds, we’ll build your personal cellar to enjoy yourself or to sell once your wines reach their evolutionary peak. Click below for more details of My Cellar. Buying 'En Primeur' direct from the producers is a method of purchasing wine before it becomes more widely available on the open market, particularly from the more sought after regions of Bordeaux and Burgundy. Wines can generally be bought En Primeur during the year following the grape harvest, often whilst the wine is still being made – which can be as much as two or three years – before the wine is finished and ready for delivery. Buying En primeur allows you to purchase at the ‘opening price’ – usually the cheapest price at which a particular wine will ever be available. It’s often also the only way of securing parcels of wine which may never make it onto the open market. Fully mature examples of the most sought-after Bordeaux and Burgundy on the market are very scarce indeed and often appreciably more expensive. En Primeur prices do not include duty or VAT, both of which are payable when the wine is removed from bonded storage and delivered. You can opt for delivery straight after the wine is shipped, or keep it in storage ‘under bond’ until you’re ready (for which a small storage fee will apply). If you’d like to cellar some wines for drinking at optimum maturity (and don’t have your own home cellar), why not give it a go?